This post will remain at the top until June 2nd, when the Candy Closes. For NEW Postings, please scroll down. TEN adorable House-Mouse and Friends, Gruffies and Happy Hoppers wooden stamps. (most are brand new with only a couple that have been well loved). Then there is a super whopping 250+ variety mix of gold, brass, bronze, silver and vintage Charms with fun themes for all your crafting projects, (like the Eiffel Tower, Fancy keys, Passport, Flowers, etc...). There is also a small assortment of colorful Lace Trims that I brought back from my recent European travels into Spain and France. Fun stuff, heh?? 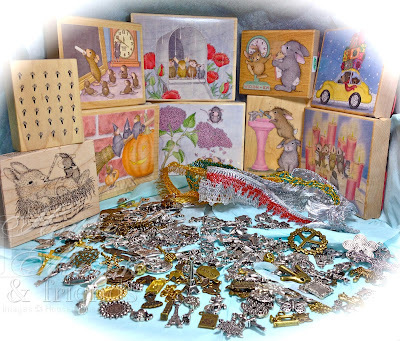 If you LOVE House-Mouse Designs stamps and you love Charms as much as I do, then this huge LOT could be all YOURS! It's open to everyone, anywhere, Internationally. Simply follow the rules for your chance. 1. Visit us at House-Mouse and Friends MC Blog and become a Follower. 2. Return here to tell me things like: what you like about House-Mouse and Friends Stamps, what other images you would like to see, or if you have favorites, or how many House-Mouse Designs stamps you have that you enjoy creating with; or if you have ever played along on our challenges, and, or, what more you would like to see our incredibly talented Design TEAM doing/creating at the fun House-Mouse and Friends MC Blog. 3. Post a picture of this Blog Candy on your own blogs and link it back to this blog. 4. If you are not already, you must also become a Follower of this Blog to win! That's it! Too easy, right? The Very Lucky Winner will be chosen in true randomness using random.org. This Candy will run until Midnight, EST, on June 2nd, 2012. The Lucky Winner will be announced on Monday, June 4th. So hurry and enter today. Hi america what a big and fabulous candy. I'm a follower on bothe blogs aong time ago. I did not do many challenges with the House mouse stamps,I have not always the stamp to use for that challenge. I have a couple of house mouse Stamps on wood not clearstamps. They all looks so beautiful and funny with there funny faces. The DT ladies do beautiful work and can not ask for more. I can't choose with stamps I like or wanted to see becaurse they all are fabulous. thank you america for this change. What a fabulous Giveaway!!! I LOVE House Mouse Stamps, they are so cute and there's so many to choose from - at leasts one for every occasion!!! I have about 20 in my collection so far. I haven't used any recently and I must get some ink on them soon!!! I have posted a link in my sidebar for you, and of course already follow your blog and the House Mouse and Friends MC Blog. Thanks for the chance to win this amazing candy. Hi America, so glad your back! I always use your cards for inspiration because they are amazing! I love the house mouse stamps and am trying to get more but so far I only have three. For some reason they are hard to find in stores around here ( what can I say my town has bad taste). I love all the mouses!!! I have been doing the house mouse monday challenges when I can for the past year. I love all the ideas and INKspiration I get from the DT cards and hopefully can start playing more since im building up my mousy stash. Thank you for the chance to win and look forward to seeing more creations from you in the future. Hi America, WOW what a terrific giveaway. I only have about 12 HM stamps but would love to have each and every one of them someday. Little by little I guess. The DT members do such an outstanding job at showcasing the HM stamps and I find this site to be very generous with these give aways. I don't know how you could improve this site. It's right up there with the best of them in my opinion. Thank you so much for giving us all a chance at this great candy. Really appreciate it. Have a fabulous week. Hope LIFE gets better for you real soon. Wowsers! I'm a follower of both blogs! I have 7 HM stamps, and am always looking for more! I like the gruffies and hoppers too! I have some awesome blog friends that inked a bunch up for me, so I'm able to play in the HM challenges more! I think the DT does a wonderful job over at the HM & Friends! I was just a Guest Designer, and was blown away with how nice and helpful everyone was! Great DT you have over there! I'm going to try now to link your candy to my blog! Whoever gets this will be in HM heaven for a long time! I am already a follower of your blog and the House Mouse Challenge blog and enter it as often as I can. I own 7 different House Mouse stamps and I adore them :) All of the DT on the House Mouse Challenge blog are so talented and I find their cards so inspiring. I have added your fabby candy to my sidebar, thanks so much for the chance to enter. I do hope things get better for you America. This is some awesome blog candy. I love house mouse. I own about 10 stamps, they were some of the first stamps I bought. I think they are so cute, I love the adorable scenes, they just put a smile on you face. OH WHAT GREAT CANDY!!!!! I WOULD LOVE TO WIN THESE AS I USE TO HAVE OVER 50 HOUSE MOUSE/GRUFFIES AND HAPPY HOPPERS...RAN INTO SOME HARD TIMES AND HAD TO SELL OFF THEM, I SO MISS THEM. OMG America firstly lovely to see you back in blog land and secondly wow you are so very generous, I am sure that so many people would be thrilled to win even just one of these wonderful images and all those sparkly charms you do spoil us. Thanks for the chance to win. I love my House Mouse stamps (I have 6 on wood and the Halloween set clear stamps) and I do follow both. I'd love to see more with babies included. And flowers. Oh wow, oh wow - what can I say......... HM is just the best ever. How can you not love these superb images??? Over here Joanna Sheen does her utmost to promote them but I think they sell themselves - well to me they do! We have plenty of room if they would all like to come over to live in the UK - cheese aplenty - it would be coming out of their ears............how could they resist? Hiya America i,m new to your blog have become a follower here and on House Mouse & Friends MC Blog, I have 5 House mouse wooden backed stamps so far 3 are quite small ones one is a sentiment which i use often it says (It,s Mice to be Loved) but i love them they are all fab and would love to win these wonderful stamps and i would certailnly give them a loving home.Have posted pic and link on my sidebar too. Hi America, I hope things do get better for you, I have missed seeing your fabulous creations. I'm already a follower of both your blog and the House Mouse blog, I have joined in many of the challenges, and have been fortunate enough to win one, and get some great HM stamps. The stamps arrived so quickly, and came just days before my birthday last week, so I felt like House Mouse was giving me a birthday present. My husband colors all my images for me, and the House Mouse images are his favorite to color. He would like me to get ALL of the stamps (that was his exact words. Smile). As to how many I have? at the moment, I can't give you the exact number, as most of my craft stuff is packed away in boxes, while we are fixing up a damaged ceiling from a leaky roof, but I know it is more than 8. I have put the link to your blog candy on my side bar. Hi America, thanks for the chance to win such great candy. I only started blogging a few months ago, but have entered the House Mouse challenge a couple of times. I have a couple of wood mounted stamps and four sets of unmounted stamps. I always try to enter the challenge when I have a suitable stamp and would love to win some more - they are so cute. I've just become a follower America, not just for the Candy though it is absolutely adorable. I only found house mouse fairly recently but I love those little mice, happy hoppers and gruffies. I think the meeces are my favourites but in real life I would love them all to come live with me. Oki dokie 2nd question I only have 4 wood mounted HM which I bought after entering and winning $25.00 gift voucher on the last Blog Hop (I sincerely thank you for that) but having had to pay shipping of $15.00 and an excess vat and handling duty in the uk of $17.00 that far outweighed the $25.00 I won. Not your fault sweetie or HM just the way the postal and customs in our countries work. My adorable new stamps are loved, cherished and treasured and used regularly. No one stocks them here locally in Scotland so they are hard to find and when you do find them the postage make it so very expensive. Your challenges are wonderful and the DT creations so very inspiring but I don't always have the stamps to suit the particular challenge theme, so I can't always enter. I apologize for the long reply, just had to let you know my own feelings. I don't expect you to post this sweetie and I hope you have comment approval on your blog. Please feel free to remove it if you feel it's necessary. I love HM but can't afford them although I follow the HM Monday challenge and try to enter when I can. Oh my goodness, what an absolutely FAB bunch of goodies!!! And WHY do I love House Mouse you ask? Who doesn't!!! There is a design for everything, and they are too cute to believe! I only have a few, but the ones I do have I love, and I get such nice comments from those who receive the cards. They are so fun to use! Thanx so much for a chance at this super candy!!! I am such a huge fan of HM stamps. I only own one but I have used it many times. I have spent hours poring over the Simon Says store and even made my mom look at them with me one day lol. I truly could not think of any more that you could come up with because every time I look you have more, covering every occasion. I am so happy I got in on this giveaway, it would be amazing to win this. Thanks for the opportunity. Oh I am a follower and I posted you on my sidebar. I will also make sure this goes on the Feline Playful blog. Good Evening America and all mousie friends. I have well over 120 HM stamps and love playing with them all. Even my non-stamping friends love these stamps. I have not had time to join challenges this school year, but summer break is coming up. Watch out, I will be back to playing with paper and ink and HM is going to be top on my list of stamps to play with. Thanks for such great blog candy. Best of luck to everyone on this one. Hi, America! Thank you for this huge candy! and again, thank you for the chanse! happy to be you follower! wow! what amazing candy.I love house mouse because there suitable for any ages, and they always go down well with everyone! I have around 15 packs of house mouse stamps and 3 wooden backed ones. I play on the challenge blog nearly every new challenge, and have been lucky to win once! All the DT are super talented! Im not sure what i would like to see them do next, as i havent seen all the designs so far, but i love the wooden backed stamp of the gruffies in the car at christmas! So cute! Thanks for this amazing chance to win! The House Mouse and Friends stamps are so cute. I love the scenes that are shown with this little Cuties. They are all so lovely. Thanks for the chance to win these cuties. I'm a follower of the challenge blog and here I'm also. And I linked the candy on my blog. House Mouse stamps are one of the very first stamps that I purchased back in the early 1990's. It was actually my DH that drug me to a table at a show, to oogle over them. That was it for me! I was hooked. Well I have a dresser drawer full of them now and love playing in the HM Monday Challenges. There are still times I don't own a stamp that fits the theme, so I love to acquire more. Thanks for the chance. I have posted a link in my sidebar for you, and ! follow your blog and the House Mouse and Friends MC Blog. I am already a follower of both HMD Blog and you! I have added your candy pic to my side bar for all to see! 1.) The reason I like House-Mouse and Friends Stamps is because they are the mose adorable images and I love how defined the rubber is, stamps so beautifully! 2.) hmmm, what other images you would I like to see, what about camping or more Christmas - can always use more Christmas LOL. 4.) I have played along on the challenges a few times, so much fun seeing the DT inspirations! 5.) what more I would like to see your incredibly talented Design TEAM doing/creating over at the fun House-Mouse & Friends MC Blog would be maybe some more altered pieces to decorate the home. The mice are just so cute that everyone should see them! Oh an of course - MORE CARDS LOL! Thanks for the chance to win your AMAZING candy - beleive it or not, from my 20 or so stamps I have it is not one of the ones you are showing in your pic! Yeah me, fingers crossed (and toes too)!! Hi America , how generous of you to give away such fabulous Candy , thank you for the chance to win . I am a House Mouse Addict, I have cupboards full of House Mouse decoupage papers, and drawers full of completed decoupage, I LOVE THEM ALL , all of my friends and family receive Birthday , Christmas and all occasion cards from me made from House Mouse stamps and or decoupage. I have the House Mouse papers and insert Cd from Joanna Sheen which makes my collection so versatile . I first stared with wooden stamps, I have only a few of these then I started some years ago collecting House Mouse rubber stamps through Joanna Sheen, and now I have too many to count of the rubber stamps. I love the detail in the stamps , they are so easy to use and are always so crisp and clean when stamped. They are etched so deeply and stamp so well , they are quite simply fabulous. As for the Mice themselves the expressions on their faces are priceless, and each stamp can be used for multiple occasions . I have played along with the House Mouse challenge just a couple of times as I only started my blog this February 2012. I was a Winner in the "So Sweet" challenge recently and was so thrilled I phoned and told everyone I knew . "In the workplace" characters , those that we could liken to the person we are sending the cards too, ie: Police , fire men , teachers, fishermen , that sort of thing. ie, exploding boxes, boxes , advent calenders ,things that are more a gift to be given with cards etc . Thank you again for the chance of winning . Hi America! Great to hear from you after looking a view times on your blog the last weeks..., hope you're well. And now you start with such a goodie, OMG! What can I tell you... you know I really LOVE House-Mouse! When I decided to stamp, the first order included House-Mouse stamps. But I love also Gruffies and Hoppers and all the other critters. This stamps are simply so cute and wonderful to give them color. So I just assorted all my stamps, and I have more HMD as I showed on my blog so far ;) But non of these you show in your wonderful candy. Since I have the blog, I try to find time to join your challenges. So thank you for that chance. Great to have you back, America. Super duper cardy you are offering. Luckey girl who wins all this stuff! I have one problem with the H&M images ; the more I see, the more I want to have!! Pehw. I'll keep my fingers crossed- but won't be able to craft then!!! Wow! What a generous prize! Thanks for the chance to win! I adore House Mouse stamps! I think what I like best about them is their life-like character and the humourous and mischievous little scenarios they get themselves into. I think I have almost 30 images (don't tell my hubby!) at the moment, but have many more on my wishlist. I have enjoyed playing along with the House Mouse challenge in the past and look forward to joining in future challenges too. Some of my favourite challenges are sketches and colour combos, while I will often shy away from themes. It is more difficult to play along with themes as I might not have an image that goes or I might not have time to make an extra project if I don't have a specific need for it. The House Mouse team does a wonderful job and I always look forward to seeing what they create for each challenge, even if I am not able to take part for that particular challenge. Hi America, I am so glad that I found your blog! I am now a follower to 2 new awesome blogs. WOW what awesome blog candy!! This is a stamper's dream!!! I just adore House Mouse Stamps. I have purchased a few and dearly love them. I do not have any of the ones that you are offering in your candy. The House Mouse characters are so lovable,fun to color and enjoyed buy everyone that I make cards for:) I would love to see more patriotic House Mouse stamps especially designed for soldiers. Thank you for hosting this precious give away for us. I really am crossing my fingers and hoping to be a winner because this would make a wonderful birthday gift. (My birthday is on June 4th.) I have posted your candy on my blog:http://u-inspire-me.blogspot.com/ Have a wonderful weekend. america, thank you for the chance & to your generosity.. God bless!! My favorite house mouse so far is the christmas design where one mouse is holding the reflective ornament while the other mouse is making a face into it. I did an elaborate card a few years back and it has become everyone's favorite. I don't have a blog so I hope I'm still eligible. WOW Girl, what a generous, wonderful candy, in fact the best candy i've ever seen. So glad to see you in blogland and I do hope things settle down real soon. Popping your candy on my sidebar, Actually I don't have that many HM stamps compared to you ladies but slowly my little collection is growing. I'd like to see some specific male orientated stamps such as the mice with a pocket watch or in the potting shed with the seedlings, I think they'd be fun. I had no opportunity to use these stamps but I would love too. They are so cute :D And there are so many different pictures. Hi America, I am a new follower to your blog. I absolutely LOVE House Mouse stamps & have quite a few. I would have a tough time picking a favorite...I love them all! This blog candy is amazing...who wouldn't want to win it??!! Thanks for the chance. Hi America, what wonderful giveaway for everyone to join. I haven't tried HM stamps as local shop in my country doesn't have them but I would love to get a chance to use them. I love the designs especially the ones with a scene and they are great to use for any themes. I shared the pic and link back to here on my blog. New follower of HM and here. Thanks for the chance. wauwwwwww what a fabulous candy you can,t still dream about so many lovely house mouse stamps, i have some housev mouse but i have lots on my wischlist, because there is so much choize!!!!!! keep my fingers crossed!!!!!! I love the cuty mouse stamps and they are all so lovely, I wish I could have them all. Some of them are allready in my crafting room and I love to stamp them and get all creative. My kids coloure them as much as I do and this is kind of a family activity here. Hello America. Hope all is calming down way over there. Don't enter me in your drawing as I have all of these stamps but 3! OH MY...a mouse-aholic here! Take care my friend. I have posted your bloggy goodies on my blog as well! WOW! What a nice array of amazing goodies! You are too generous! I had to admit that i am a newbie on the HM blog, but from what i have seen so far, their stamps are simply as cute as cute can be! I love every single one of them and am working on my wish list right now! :) Thanks so much for the chance to win! Hello America ;-). Just popping in to say hi and to let you know that I added your candy to my Blog Candy Cauldron Linky. Thank you so much for this wonderful and extremely generous opportunity. I thought I was a follower of this blog already and found out I am not, but I am now! House Mouse has a very special meaning to me as it's the one brand of stamp that is exclusively what my Mother purchases for me for every special occasion or holiday. I am like a kid at Christmas waiting to open my stocking! I love the reason for House Mouse and the foundation on which it was created. A completely wonderful and unique stamp company. Thank you again sincerely and I do hope 'Life' lets you craft again very soon. What a gorgeous candy, America....keep my fingers and toes crossed! Thanks for offering! I love House Mouse stamps a lot, although I use them not enough...I own some stamped images and I also have the Christmas Opening stamps...I always enjoy the challenge blog with the great DT creations and have entered a few times. I became your follower and posted your candy on my sidebar. I LOVE House Mouse, Happy Hoppers, and Gruffies stamps! I do wish they'd make more Happy Hoppers. I don't think I've seen a new one in a while. I could never pick a favorite stamp--they are all so adorable. I don't know how many HM stamps I have--just know it's not enough. LOL. I play in the House Mouse and Friends challenges frequently. I love looking at all of the beautiful DT cards--both in the original post and in the mid-way reminder. I can't think of a single thing the DT could do to make it better (other than select me as the winner--LOL)! I love the challenges, I love the cards they make, and I love how many of them stop by my blog to leave comments. They are a sweet and thoughtful DT--one of the best around. Hi America, i'm Enrica and i'm a new followers!!!!! thank-you for this chance your candy is amazing!!!! i was visited your blog, and your card's are beautyful.....amazing!!! ( sorry i'm italian girl, my english is very little):) bye bye!!! Wow, was für ein tolles Candy. Ich habe leider noch sehr wenige Stempel aber vielleicht sinds ja bald mehr. lach. Liebe Grüße. WOW!!!!!!! this is a crafters dream! specially when you love House Mouse and friends like me!!! !.I do own some about 10 of the sets and singles about 5. The images are very cute and comical, anyway thanks so much for a chance to win! Hello from a new follower! You have a lovely blog! I have linked up your candy. good luck to everyone! Fabulous giveaway America, someone sure is going to be lucky. I'm already a follower of HMCB and yes I have joined in some of their challenges. Their stamps are adorable but I don't have any of my own. I have a friend that stamped me a couple of images. My favorite stamp has to be the one called "Mouse Drops" I don't know why, i just love it. WOW!!! Great give away...... When I got hooked on rubber stamping about six yrs ago I fell in love with Hm. I Now have about 200 (Mostly old). I just found your blog. Thanks for the chance . Hi! Great giveaway! I dont have any of your stamps as i am just a beginner in cardmaking. i just found your blog and and its so fun! Thanks for the chance to win! I just love House Mouse. I have it as my screen saver so I can Enjoy my mice all the time. I love the humour of the stamps. They are funny and cute but they are also very sensitive and knowing. Hi! Unfortunately we don't have here House Mouse products, but I love these designs, they're so cute and I'd LOVE to win some! Thanks for the chance! I'm now a follower and It's the first time I see these stamps cause I'm Italian crafter...I really like them because they're so big and can be colored with markers..and surely they'll make great card!!! !I hope I win them to make my italian crafter friends see them!!! Lovely candy. Thank you for giving us the chance to win these goodies. I love the cute motives on the House Mouse-stamps. I just adore House Mouse stamps, they are all so cute. Easy to colour too. I am a follower of your blog & House Mouse blog already. I have been a GD on House Mouse too, loved it, gave me an excuse to spend some more pennies on stamps. I only have the unmounted stamps, not wooden, so would just love to win this collection. I would love to see House Mouse available in Digi form. Love the House Mouse site and would love to enter to win the blog candy, but I don't have a blog! (I know - in the dark ages! lol) Erin, you have beautiful cards! I couldn't begin to pick a favorite! I'll check back in frequently and catch you on SCS. Wow, what a fab and very generous blog candy. I haven't been blogging very long but have been drooling over House Mouse for a while now. I haven't got any of it yet :( I'm currently on a spending ban as I'm going to a workshop and show in July so have to save up. The design teams do such an awesome job, they're very inspiring. Thank you so much for the chance to win this. I am following both blogs and have displayed your candy on my sidebar. Hello! I now follow your delightful blog. I only have one House Mouse Stamp, but I love it very much. I have posted a link on my blog, http://scoopie77.blogspot.com/. Hi America!!! I have been missing you!!! And wow look at this candy! How I would dearly love to win! I love House Mouse stamps! I need to use them more often but as with most people time just gets the better of me! Thanks for offering up this candy! You take care and God Bless You!!! was für ein wundervolles Candy, Ich liebe House Mouse. Vielen Dank für die Chance es gewinnen zu können. I love HM and many of the little fellows have been given a home with me. I became a disciple and follower of your blog's House-Mouse and friends. The picture posted on his blog http://brideblack.blogspot.com/. Oh, I'm delighted with the House-Mouse, like everything. And I uverana that the House-Mouse and friends, a feeling of joy for all people and feeds inspiration. Great good luck to you and the House-Mouse. What a big and fabulous giveaway!! I have'nt participate many House Mouse challenges, because unfortunately I didn't have a lot of House Mouse Stamps. Therefore I would be very happy to win this candy. They look so beautiful and funny. I follow both blogs, and I've put a Link in my sidebar. If you like, you can even take look at my blog, actually I've posted a work with a House Mouse image. What a super Candy, I am a follower of both blogs and only have one House Mouse stamp so this would be great to boost my supplies. Thank you so much for the chance to enter this draw. Thanks for the chance to win this generous candy! Oooh gorgeous candy! I don't have any HM stamps, so I'd love to win your goodies, they're adorable and have the cutest faces! Hello America, I love the House Mouse stamps and things. They are soooo cute and sweet. The first House Mouse card I received was when I was sick; it was sick Henry... sooo adorable. I've become a follower of your blog and hope to visit you many times. I've linked to your candy on my blog. Hope you like to visit my blog one time? Hello!What a fantastic giveaway!! !Thank you for the chance to win! I don't have any of such stamps but I'd love to have some, they are really soooo cute and sweet, the images are just awesome! What a great name. Thank you for the chance to win this wonderful blog candy. How exciting. I love House Mouse Stamps! I keep trying to collect them but it's way to hard to keep up, lol, but I will keep trying. I am posting yur blog candy picture on my sidebar, just learning So I hope to get it right. What a fantastic give away. Just love it. I love House mouse because they are innocent. So sweet. They make me smile. I have some House Mouse stamps. The one that is called "Monica Romances" I often use on my envelopes. Some month's ago I did win many hotfix beads(Is this english?) Thanks a lot for that again. Your blog candy is also on my sidebar. I'm new to house mouse and I'm really loving what I'm seeing, so cute! I am a new follower on both blogs . Was für ein wundervolles Candy, großartig. Vielen Dank für die Chance, es zu gewinnen. Ich liebe House Mouse und habe selbst schon einige Stempel davon. Dein Candy habe ich in der Sidebar verlinkt und bin Verfolger geworden. I have about 30 HM stamps and I love them all. I am a follower of both your blog and HM and Friends. I participate in every challenge. What a great opportunity to add to my collection. Thanks. What absolutely super sweet blog candy you have. I love House Mouse stamps they are so cuddley cute that you just want to squeeze them. I only have a few in my stash as they're not easy to get hold of here. My favourite is "Are we there yet?" not because it cutest or the most useful but because it has a puppy on it and I'm so partial to puppies. I've only just discovered the challenge blog and hope to participate soon. Thankyou for the chance to add to sweetness to my stash. Hi America What a fabulous CANDY!!! I LOVE House Mouse Stamps, they are so cute I have about 8 House Mouse in my collection so far. I have posted a link in my sidebar for you, I follow your blog and the House Mouse and Friends MC Blog. Hi America, What a great and fabulos Candy. I'm a great fan of House Mouse stamps, i love the cute images. i don't have a favorite stamp, i love them all. Thanks for the chance to win this super candy!!!!!. Please keep going on making this adorable stamps. Hi America....great collection of fun goodies to be given away....someone will be extra lucky to receive it. I currently do not have any House Mouse stamps but love them all and would absolutely adore having these in this collection! Oh wow this is a Great Candy! Amazing, you're going to make someone really happy. I love Housemouse!!! Unfortunately the stamps are really hard to get in the Netherlands. I do have some clear stamps though and can't pick a favorite one. Hello! I'm Natasha. I'm from Russia. I haven't seen Housemouse before! I love it now! It's so cute that pictures! And I want it!!!!! What an amazing and generous blog candy America, and as nice as it is I'm just glad to have you back blogging and joining in with us all again. I've had an incredibly busy period myself and have hardly crafted at all for a couple of months, I've even been missing the HM challenges and that's just not like me! Currently I have about 40 HM stamps but more are on the way as I had some Amazon vouchers burning a hole in my virtual pocket! Can't pick a favourite they're all so cute, but I really have a soft spot for the Christmas ones and often have to force myself to buy something not Christmas related once in a while. I follow both blogs and have added you to my sidebar too. I'm new to house mouse and I'm really loving what I'm seeing...mice are so cute!!! This Mouse-House is Awesome!!! Wondering Pic! WANT IT! I don't have any of these wonderfull stamps but I really want to have one. HouseMouse Designs are really amazing. I WANT THEM! House Mouse stamps are real cute and kind of humorous...just make me smile seeing them. YAY!!!!!!!! I have been having a little computer problems lately, so i'm SO hoping i'm not too late for this! I'm sending you my info RIGHT AWAY! was ist es für ein tolles candy, danke schön. damit ich dabei mitmachen kann, habe ich mich angemeldet und verlinke das candy auf meinem blog in der sitebar unter blog.candys. ich lie die house-mnouse und happy-hopperm und die bären. einfach nur toll.